The punctuation station is a great place to work with capitalization and punctuation. I transfer the sentences from the workbook pages on sentence strips. ﻿and ﻿cut up spaghetti noodles and beans for exclamation points. as periods, question marks, and exclamation points. 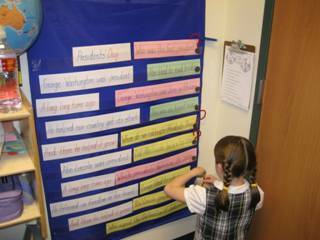 You could also include some sentences to unscramble and punctuate. Student recording sheets extend this activity and provide accountability.